Are the critters getting smarter, or am I getting dumber? This year, the squirrels and chipmunks have been besting us at every turn. It is sometimes comforting to think that humans are smarter than other animals, but if I ever believed that, I no longer do. As some of you know, my husband and I moved to a lovely condo in the woods last winter. We had a real deck for the first time, and after erecting several feeders complete with squirrel baffles on the deck railing, we reveled in the fact that a wide variety of birds arrived quickly. We could see the birds close up while we ate breakfast. This was much better, we thought, than our pole feeder way out in the yard of the house we had moved from. We offered shelled sunflower seed, mixed seed, thistle seed, suet, and safflower seed. We had been told that birds like safflower but squirrels don’t. We were so confidant of this that we didn’t even put a baffle on the safflower feeder. All went very well for awhile, and we were even accused of stealing other people’s birds. In the spring, we hung a hummingbird feeder and were thrilled when a lovely pair started visiting several times a day. Later in the spring, we planted patio and grape tomatoes in pots on the deck and were happy when they bloomed. But in late spring and summer, all our plans went awry. Our gray squirrel visitors were dominated by three young siblings. One of these juveniles seemed much more athletic and intelligent than the others. The safflower was the low-hanging fruit of course. At first the squirrels ate the safflower sparingly and the birds seemed to like it almost as much as the other seeds. However, our squirrels soon developed a passion for safflower and were monopolizing that feeder. 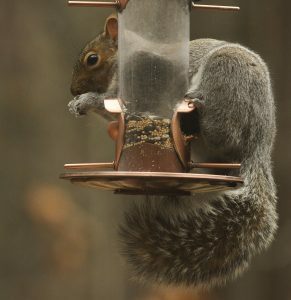 Then our young genius gray squirrel started planning for tastier fare. It studied the feeders and their defenses carefully. It crawled up the poles and tested the qualities and physics of the baffles. It seemed to be triangulating angles and calculating speed and momentum of flight, as it turned its head this way and that. Suddenly, it seemed to have a plan of attack, and would try a daring move such as jumping from the porch railing over the baffle, or taking a tremendous leap from one feeder to the next. It failed a few times and ended up falling about ten feet all the way to the ground, but was completely undeterred. Eventually, it figured out that it could just spread-eagle crawl right over the long can-type baffle, like a child climbing a coconut tree. After it was up one feeder and had finished off all the food available there, it was easy business to jump over to the other feeders. It even figured out that it could get all the sugar water in our hummingbird feeder by jumping onto the roof, hanging upside down and tipping the water with one paw while lapping it all up. Now I ask you, does a squirrel need sugar water? There is a perfectly wet pond within a few feet of the deck. Not to be deterred, we countered with attempts of our own. We separated the feeders considerably and raised them several feet higher. That didn’t help for long. At this writing, we have gotten it down to one feeder pole with mixed seed and suet, and put on a second baffle, a large cone-shaped one. For the moment, our genius is deterred, but it is testing out this new set up trying to crack the code. We have hung the hummingbird feeder on the same pole as the others. Our other critter problem came from the chipmunks. It turns out they love tomatoes. When our tomato plants produced fruit, the chipmunks ate them all while they were still very green. I tried spraying chili pepper water on the tomatoes, but the chipmunks seemed to like that just fine. However, Agway solved our problem with a product called Repels-All. It is a natural concoction of all sorts of nasty smelling stuff such as “putrescent whole egg solids”, fish oil, and urea. You spray it on the tomatoes and they leave them alone. I spray it after every rain. When we pick the tomatoes, I wash them and there is no residue. They taste great. Now maybe I should try spraying that stuff on the bird feeders? Many thanks to all flora and fauna reporters for the month of August. Please send reports by September 26 for inclusion in next month’s article. You can write me at 7A Old Colony Drive, call me at 692-3907, or e-mail me at mariancharman@gmail.com. Esther Donlon, Providence Rd. July 1, mother turkey and several poults in yard. Doe and two fawns running in yard. July 4 and 9 evening, lone coyote walked length of yard, heading off into Adams woods. Dot Mooney, Monadnock Drive. July 27, opened porch window and the air coming up from rain-dampened woods smells good. Birds chattering, one bunny hopping about in the wet grass. July 29, on front step, saw tree swallows swooping overhead. A cute hummer stopped in mid-flight to look at me, then darted away to my neighbor’s hanging petunia. July 30, stood on porch before sun rose, saw two bats swooping over back lawn, catching early morning breakfast bugs before turning in for the day. Kate Hollister, Vinebrook Rd. July 30, watched a large doe and three fawns tiptoe across our lawn. Goldfinches like the catnip. Beaver in a neighbor’s back yard. Marian/Bill Harman, Old Colony Drive. July 30, blue jay, downy woodpecker, male cardinal, two robins, titmouse family, catbird, five goldfinches at the feeder. Marian/Bill Harman, Old Colony Drive. August 1, a walk along the trail: indian pipes in three clumps, pipsissewa, rattlesnake plantain, whorled loostrife, sweet pepperbush, white water lilies, high bush blueberry, purple loostrife, a rush, white and yellow mushrooms, pickerelweed, bull lily, buttonbush, buckthorn, elderberry, winter green, partridge berry, spotted touch-me-not, two juvenile red-tailed hawks, hairy woodpecker, green frogs, phragmites, cattail, great-blue heron, chipping sparrow, titmice, white-breasted nuthatch, catbird, goldfinches, chipmunks, grey squirrels, blue jays. August 6, hottest day of the year, 95 degrees. August 7, male hummingbird visiting the mint flowers. August 9, juvenile blue jay on deck. August 1, juvenile chipping sparrow, hairy woodpecker, male rose-breasted grosbeak, red squirrel. Walk on our trail: lots of mushrooms, Indian pipes, two wood ducks in swamp. August 6, tiger swallowtail butterfly. August 16, a walk at Nab. School woods: mostly pine and oak, white pine, pitch pine, red oak, yellow birch, lady fern, pipsissewa, a few lady’s slippers, low bush blueberry, several small American chestnut trees, blue jay, pee-wee ( a surprise), chickadee, titmouse, crow, white-breasted nuthatch, mourning dove, hairy woodpecker, haircap moss, several mushrooms. August 19, at Providence Rd., a monarch butterfly and several tiger swallowtails around the pond in the milkweed area. August 23, lots of small red dragonflies flying around the shrubs near our garage. A baby crow calling, pee-wee heard near the mailbox. Two juvenile red-tailed hawks calling. August 26, three female turkeys frequently pass through. Later, a blue jay doing a very good version of a juvenile red-tail call while sitting on our deck railing. Penny Lacroix, Village View Rd. August 2, caught a bobcat on our wildlife cam last week. Susan Mudgett, Tadmuck Rd. August 7, for the past week a pair of goldfinches in the wild thistle and at least two monarch butterflies in the milkweed seen outside my window. Diane Duane, Howard Rd. August 7. I saw two monarchs today, one in front of my house and the other at Town Hall. So far, we have seen four monarchs near our pollinator garden in the past few weeks. Also, this morning a female turkey with seven chicks. Tom Ennis, Almeria Circle. August 7, trees in the yard seem to have grape vines winding their way through the forest. This is a new find. Donne Cecere, Calista Terrace. August 13, Summer report: we have had house wren nests built in three birdhouses. They like to talk loudly and make great watching. A hawk came down swiftly and took a chipmunk. Another hawk startled me when I was tending to my garden, just brushed by my head and swooped up another chipmunk. The pesky squirrels seem to have multiplied. Also, mourning doves, robins, tufted titmouse, cardinals, black-capped chickadees, blue jays, grackles, red-winged blackbirds, house finches, goldfinches, white-breasted nuthatches, rose-breasted grosbeaks, northern flicker at suet, and hummingbirds. Leslie Thomas at Lyberty Way. August 20, two grouse seen at the entrance to the road. Sue Bonner, Plain Rd. August 22, our mother turkey returned on August 4, with only two chicks. We continued to see the female and two chicks once or twice a day August, 5, 6, 9, 10 and 11. At the feeder, we put our mixed seed, black oil sunflower and suet and safflower. Since putting out the safflower, we seem to have more goldfinches, house finches and titmice. Other birds at the feeders include lots of sparrows, grackles, starlings, cardinals and blue jays. A crow tried to figure out how to get to the suet by hanging from the shepherd’s crook and trying to bend down to reach the suet. We have a container of water on our stonewall and a plant saucer with water on our deck. Squirrels, chipmunks and birds enjoy water at both places. The birds use the saucer on the deck for bathing too. We have several bunnies that seem to like certain plants in my perennial bed. My red-orange Millions Bells hanging plant has been a magnet for the hummingbird. We have had nine squirrels, two of which are light tan, at our stonewall where we put seed, under the feeders and even hanging on the feeders, despite the squirrel baffles. Our six blueberry bushes, which we did not net this year, have fed squirrels, chipmunks, birds, the turkey and her chicks and three deer. Marian Harman is a member of the Westford Conservation Trust, a non-profit conservation organization whose purpose is the preservation of Westford’s open spaces and trails. The Trust welcomes new members and volunteers. Check out our website at westfordconservationtrust.org or visit us on Facebook.